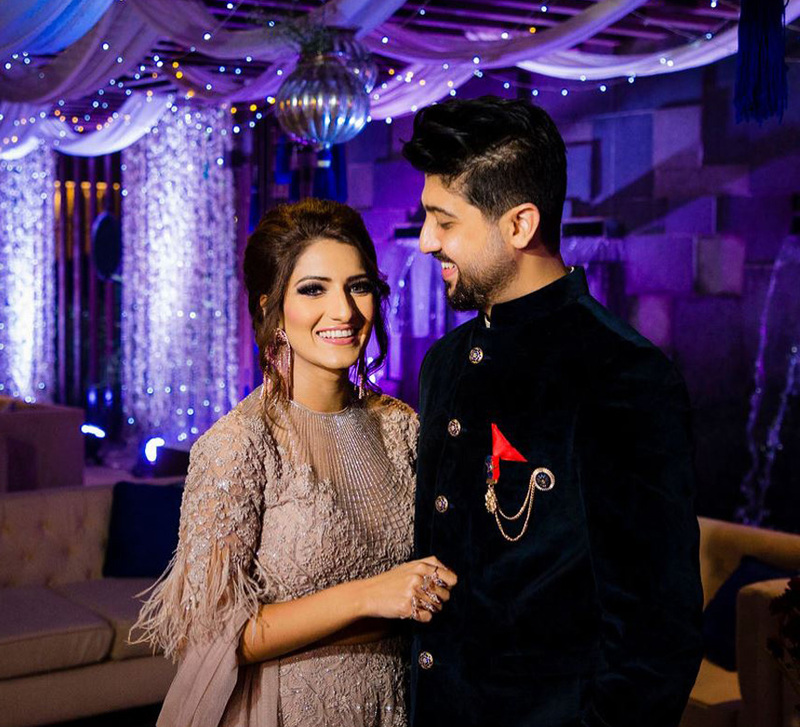 From gift hampers containing seeds to mandap pillars covered in jute, the wedding of Kannada stars Aindrita and Diganth was an eco-friendly affair. 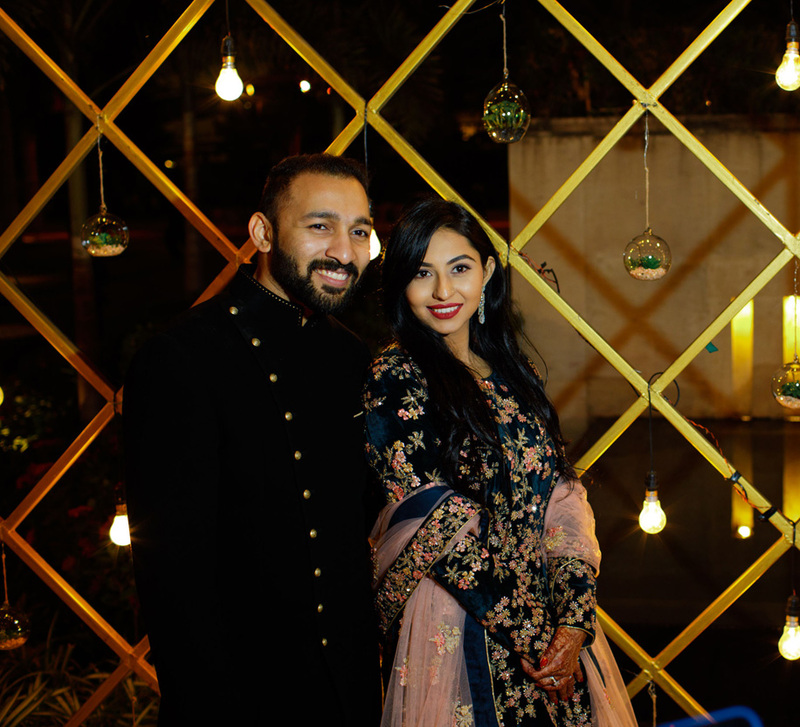 This celebrity wedding involving Sandalwood (Kannada film industry) stars Aindrita and Diganth was an ode to their diverse cultures as well as a commendable effort to minimize the negative impact on the environment. Bride Aindrita is Bengali, while groom Diganth is Kannadiga, the two met on the sets of a film shoot. Check out the photos and highlights of the planet-friendly festivities here. The couple was keen that their wedding celebrations should have minimal negative impact on the environment. Their nuptials were planned by Emaginations Inc. and the team put in a lot of thought into ensuring that the arrangements reflected the couple's concern for the environment and animals. Recycling was the core theme at the festivities, and all the elements used as part of the decor had been given an eco-friendly makeover. The hampers that accompanied the wedding invitations represented the cultures that the couple came from and were created using packing wood. The tray contained a box of rasgullas specially brought in from Kolkata, a pouch containing an assortment of vegetable and flowering seeds, and another jute bag with coffee and a jar of mango pickle from Malnad. Discovery Village at the foot of Nandi Hills was the venue for the wedding. Their unconventional green retreats set in scenic locations follow responsible luxury as well as eco-friendly hospitality practices which aligned perfectly with the concept of the celebrations. The reception was held at The Ritz-Carlton in Bangalore. 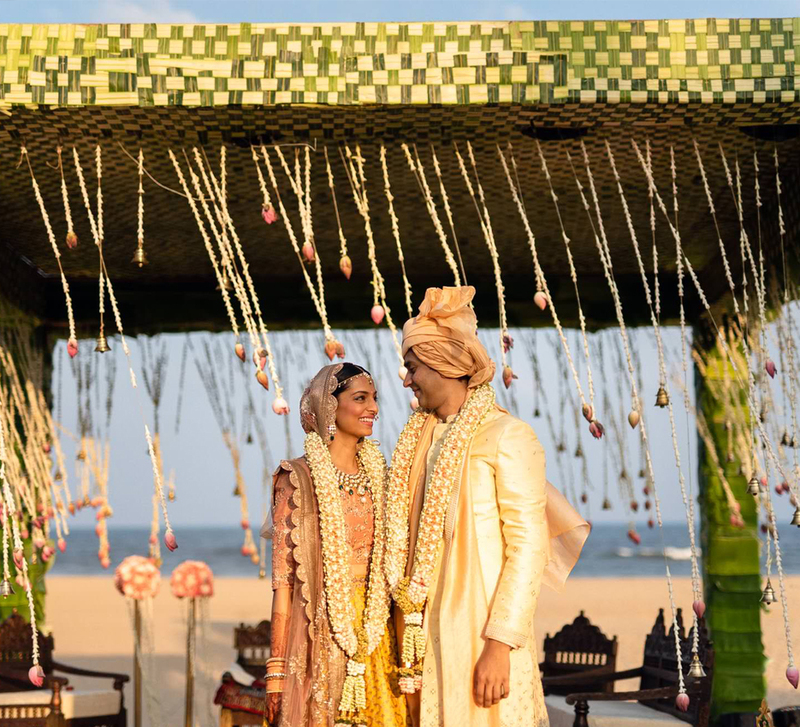 The wedding celebrations began with a haldi ceremony that had a pastel theme. Soothing, romantic colors such as light pink, peach and the softest lilac transformed the venue into a dreamy spot. A canopy for the couple was set up overlooking the pool. Glittery strings of crystals and floral arrangements were part of the decor too. The outdoor setting exuded an informal vibe which ensured that the guests could relax, talk, dance and drink. The dhol players and DJ had everyone dancing away in high spirits! Their wedding ceremony was held amidst the mountains of Nandi with decor that had a very earthy appeal. The pillars of the mandap were draped using white fabric and jute while the roof made use of fresh green leaves and pretty white flowers. A chandelier hung from the center and it lit up the setting beautifully. Kannadiga, as well as Bengali rituals, were observed at the ceremony as a nod to both Aindrita and Diganth’s cultures. 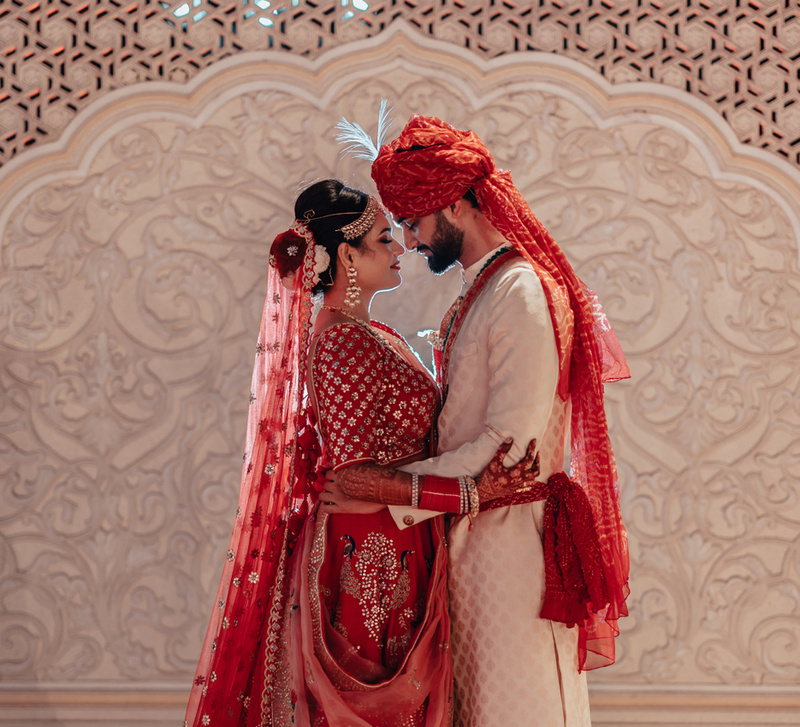 For the reception, the wedding party moved to The Ritz-Carlton hotel in Bangalore, and the event was a star-studded affair where many celebrities showed up to wish the couple. The decor for this function was very minimalistic with just a beautiful backdrop adorned with flowers and the couple’s logo created with marquee lights in the center. The setup also doubled up as the photo booth for the reception.